All World Language courses at FLCC are built on the same organizational platform and fitted with level-appropriate content and objectives. Each course contains course objectives. 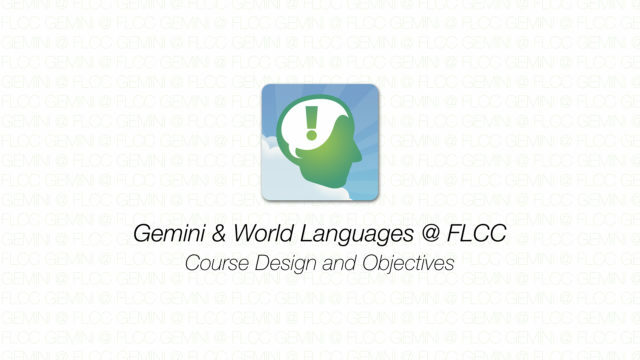 These course objectives are supported by six Learning Modules with individual module objectives. Each learning module contains objectives, content to be studied, and a total of six tasks to complete utilizing the content provided. Four of these six tasks are designed to employ the content and complete the module objectives in each language modality. Pieces of realia that students may encounter in their personal or professional lives. Emphasis placed on holistic proficiency and critical thinking skills when working with gaps of knowledge. Technical proficiency of all aspects of written communication including spelling, vocabulary use cases, grammar use cases, syntax, and more. Focus placed on micro-elements instead of macro-works. Recordings provided via YouTube. Students are encouraged to listen and repeat as much as they would like. Creative works that emphasize student creativity in solving problems or communicating needs to people they meet. Each learning module also contains two tasks that are geared to satisfy SUNY General Education requirements. Both tasks are to be completed in English, with the option to be completed in the target language. As long as the module objectives and primary tasks are completed, faculty are encouraged to supplement with additional activities such as conversations, simulations, games, etc.